Wondering what the book is all about? Read below for immediate access to the Chapter: Note From Jeff Levitan. Growing up broke on the south side of Chicago, I was committed to living my life to the fullest. My philosophy is that we were put here on earth to experience life completely and find fulfillment at every step. We are all given the gift of a short, finite, precious life on this Earth. Don’t you think we ought to live that life on purpose? I do! The pursuit of our goals, dreams and whatever makes us happy should be exhilarating. My purpose here on earth is to make an immense impact on the lives of millions of people and to leave a legacy. My legacy will include my family, the books I write, and the companies / organizations that I start and influence. Our book STOP IT! 7 Mistakes to Avoid When Starting Your Relationship Marketing Business certainly captures the spirit of my own principles. We wrote this book to remind everyone that we are not held captive to our own circumstances and we can become the creative forces of our lives, capable of achieving the extraordinary that God intended for us. Based on that, I am presuming that you picked up this book because you are seeking encouragement to seize life’s challenges and, more importantly, to ­follow your dreams. Hutch and I know that whoever you are, whatever success you’ve already achieved, whatever challenges you are currently experiencing, this book will make an inspiring and positive impact on your life! How do we know? 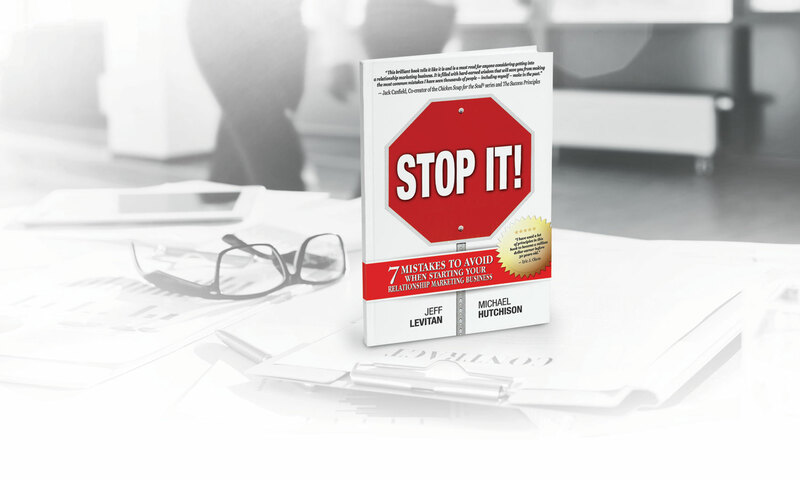 This book lays out exactly what you must consider when starting your relationship marketing business: the seven mistakes that unsuccessful associates made when starting their business. Avoiding these mistakes is what the most successful leaders do to set themselves up for success. Though understanding the mistakes and avoiding them is crucial, much of your success will be dependent upon pursuing the right business. Focus on a business that leverages and builds your talents and strengths further. Doing so will give you a sustainable, long-term advantage. Most entrepreneurs, unfortunately, do the opposite. They focus on improving their weaknesses and for most people that only leads to frustration and poor performance. The first question is: Where do you start? Your character, moral compass and the Core Values you bring to every interaction is just as important as the company you work with or establish. If you are a person with high standards, integrity and kindness, your company or the business you work with should be too. In terms of partnering with another business, focus on what you MUST NOT listen to when it comes to choosing a relationship marketing company partner. If you hear any of the following lies, know that they are just that: lies. You will get rich quick: Checks will just come streaming in every month. You won’t have to do any recruiting. Timing does not matter when you join. Your leader does all the work for you. I will place people under you. You will never have to pick up a phone or talk to people face to face. If someone makes one or all of these false claims to you, consider moving on. You can’t build lasting relationships with other people when the relationship begins with false claims. Remember: Life either promotes you or exposes you. If you lie, you will be exposed. Here’s my request: Please do not say false and misleading things about your product, service or relationship marketing in general to anyone. If you do not know the answer to a question, say so upfront and let them know you will find the accurate answer. If you are insecure about the legitimacy of your product, service, idea or business and feel the need to exaggerate or falsify your courage and confidence, please STOP IT! I encourage you to crush the lies you find out there. Tell the truth. Honesty is and always will be the best policy. Integrity is your most precious asset. Like our bodies, integrity requires proper nutrition (the honest truth) and exercise (telling it like it is always) to become strong and self-evident. While it is possible to have people placed under you or to do a great deal of marketing online, any business you join will require work on your part. This is where many people fall prey to the hype. All relationship marketing businesses involve work. They call it “work” for a reason. You have to go to work. You must be willing to treat your opportunity as a business and not a hobby if you want to see financial results. If you treat it like a hobby, it will pay like a hobby, nothing and most likely cost you more. The truth is that there are some truly great businesses out there that can provide ample opportunities for you and your family. Whether face-to-face or online, relationship marketing is the way business gets done in today’s market. People work with and do business with those they know, like and trust. According to “Socialnomics” by Erik Qualmann, a whopping 78% of consumers trust peer recommendations more than traditional advertisements. For example, if you watch a movie, and really like it, you are probably going to recommend it to your friends and family. Similarly, when a new restaurant opens and you try it and like it, you will let others know about your enjoyable experience. Your word-of-mouth (WoM) advertising and recommendation is usually the reason for others to go and try it. The movie theatre and restaurant owners benefit from your recommendation. The difference between ­casually recommending and formalized relationship marketing is that relationship marketing companies pay their independent business owners for recommending the products they share with others. People love people and want to belong. We are social beings. We long for human connection and community. People get excited about being around like-minded people. When you think about organizations such as Weight Watchers, AA, churches, book clubs, Jenny Craig, the one common element that creates longevity and viability is a support system. These organizations meet regularly and form groups. Tremendous emotional bonds are formed during these weekly gatherings. What’s effective is a support system where everyone makes small commitments to each other. Typically people receive more encouragement and support in these groups than they do at home or with family. Relationship marketing is the most effective business model available that matches / models and monetizes these support groups. Relationship marketing is social support. Relationship marketing provides the right kind of support at the right time. What I love most about the relationship marketing industry is that in order to become massively successful, you must become great at assisting others in achieving success. You must live to give to others. Relationship marketing is the only industry in the world where contribution plays such an important role in achieving wealth. When you simply learn to live to give and make other ­people’s dreams and goals more important than your own, you achieve ­success. In relationship marketing, everyone’s in Human Resources. You are paid to develop the talents of the people you work with. In relationship marketing, the more you give to live and serve others, the more your career begins to build ­itself. STOP IT! 7 Mistakes to Avoid When Starting Your Relationship Marketing Business is a reflection on my own life and work. Reading this book, you will have lots of “Of course!” moments; also some “Yep, I see what Jeff and Hutch are saying and that makes sense,” moments. How do I know? Like I said, the book is a reflection of my life and work. I’ve “been there, done that,” which is why I can share this wisdom with you. In the end, you will be able to identify the mistakes that have taken you off track. You will also reinforce all the right things you have been doing all along. Keep these up! More importantly, you’ll be able to use that knowledge to your advantage and to teach it to your team. Hopefully, this book will fire you up and give you a renewed outlook on life and business. Read and apply our book and make your own life a book that everyone will want to read. Thank you for allowing us to share our mistakes and skills with you. I look ­forward to meeting you personally one day soon. Do your business a favor and ORDER TODAY! Jeff and Hutch will be donating 10% of book sales to All For One. This non-profit organization helps children in underdeveloped countries.